Kick start your vacation in Cancun and Riviera Maya with the best Cancun Adventure Tours & Excursions. Let your senses go beyond your limits with Happy Shuttle Cancun, where your adrenaline levels will be at the top and your will have the greatest Cancun Vacation. Adventure activities in Cancun are ideal for people that love the outdoors and that want to take a break from the beach or shopping malls. Here at Happy Shuttle Cancun we have tours for those looking for extreme sports in Cancun and Riviera Maya. 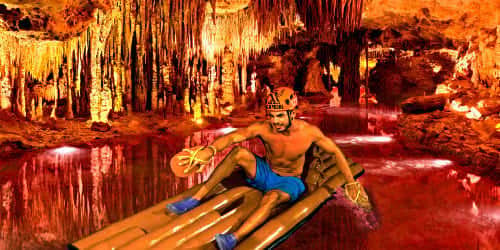 Most of the tours take place in the tropical jungle, cenotes, caves and of course the sea. The area is known for the amazing colors and diverse fauna such as: spider monkeys, toucans, parrots, flamingos and butterflies along with regional trees like: ceiba, chechen, mahogany and palms. Things you won’t see anywhere. If you are looking for the best zip line in Cancun Xplor Adventure Park and Xplor Fuego Mexico must be your first choice without a doubt. Make your dream come true and fly like a bird in a 14-zip line circuit 45 feet above the ground overlooking the Caribbean Sea. 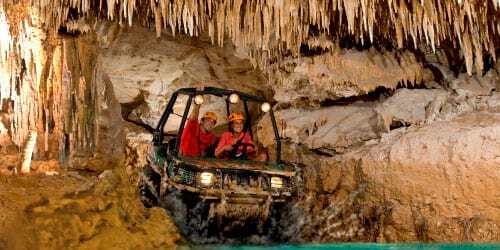 Also, prepare to experience speed in a different way by driving amphibious vehicles through caves, crossing suspended bridges and rustic jungle trails. Making it one of the best Eco Parks around Cancun. Booking with Happy Shuttle Cancun gives you the opportunity to enjoy a variety of Extreme Activities in Cancun with the best packages and prices available. We will cover your admission and transportation to and from the park in a comfortable van with A/C by our certified drivers. We highly recommend bringing casual clothes and shoes, swimsuit, biodegradable sunblock and credit card or cash. Certain activities are not recommended if you have heart diseases, pregnancy and back pain. Your Cancun Outdoor Activity is just one click away. 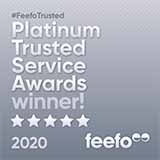 Book online and enjoy exclusive promotions!